We have heard Him ourselves, and know that this is indeed the Christ, the Savior of the world. – John 4:42. 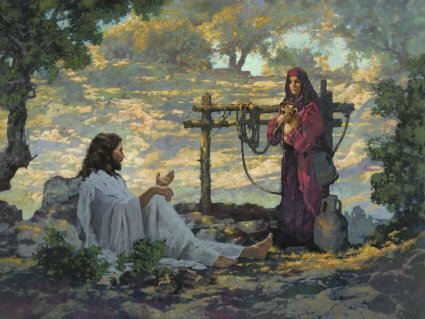 Then the woman went into the city with haste, and said to the men: “Come, and see a Man who told me all things that ever I did; is not this the Christ?” She wanted others to share the joy she had found in her faith. Some of them at once believed on Jesus because of what the woman said. The Samaritans then besought Jesus to tarry with them; and He abode there two days. And many more believed in Jesus because of His own Word, saying to the woman: “Now we believe, not because of thy saying; for we have heard Him ourselves, and know that this is indeed the Christ, the Savior of the world” (Read this in John 4:27–42). This is the proper way to obtain true faith in Jesus: See Him for yourself in the Gospel; hear His Word. And true saving faith is to trust that Jesus is indeed the Christ, the Savior of the world. It is through the Gospel that you have been brought to saving faith in Christ; and through the power of His Word you may attain to firmness in this faith. You do not need to wait for a special time or go to any special place in order to be instructed by your Savior. In your Bible, you have His pure Word readily accessible at all times. May God graciously strengthen your Christian assurance, that you, too, may say: Henceforth I believe, not because of the saying of others; for I have heard Jesus myself, and know that He is indeed the Christ, the Savior of the world. This is the faith through which you shall conquer all and enter heaven. PRAYER. – God, my God, grant me Thy Holy Spirit, that I may at all times seek, see, and hear Jesus myself in His Word, which Thou hast so graciously given me on the pages of Holy Scripture. And thus, my God, let me grow ever more firm and ever more certain, yes, become firmly established in my faith and fully assured that Jesus is indeed the Christ promised in the Old Testament, the world’s and my – even my – Redeemer and Savior. Amen.